FitnessRX for Women > Nutrition > Healthy Eating Tips > Shake It Or Leave it? There are a lot of misconceptions out there related to salt and sodium. Most of us think we need to decrease or even stop taking in salt completely, but actually that’s not exactly true. As an athlete, increased activity can result in excessive sweat production leading to sodium loses. According to dietary guidelines, the recommended daily upper limit for sodium is 2300 mg or less, roughly 1 tablespoon. The Institute of Medicine recommends adult women need no more than 1500 mg of sodium per day to meet daily needs. While recent data analysis of the general population showed that most people consume an average of 3000 to 4800 mg per day, this data does not apply to those who follow a super clean diet full of whole foods and little processed foods. Those individuals may not even reach the recommended minimums. Furthermore, depending on how much exercise you perform and how much you sweat will determine your daily needs for salt. On average, most athletes sweat about 500 mg to 700 mg of sodium per pound of body weight loss during a training session. Taking note of your weight before and after exercise can help you determine how much supplemental sodium you need in your diet. Sodium plays many important roles in your body. It helps maintain fluid balance keeping us hydrated, helps transmit nerve functions, helps maintain normal blood pressure and blood volume and is involved in contraction and relaxation of our muscles, including the heart. What If You Have Too Little? Athletes are less likely to suffer with too much sodium and more likely to suffer with too little sodium. Low blood sodium results in a condition known as hyponatremia, which can cause fatigue, nausea, muscle weakness, headaches, bloating and disorientation. Balancing fluid and sodium intake can prevent hyponatremia. Consuming electrolyte sports drinks that provide sodium and potassium can help prevent dehydration. What If You Have Too Much? Our body self regulates the amount of sodium via the kidneys. If the body is too high in sodium, the kidneys excrete the excess. Whereas, if the body is too low in sodium, the kidneys hold on to it. However, if your intake of sodium is too high, sodium will start to build up in the blood, binding to water molecules and increasing your blood volume. This causes your heart to work harder and puts added pressure on your arteries. If sodium levels are not decreased, this can lead to fluid retention and an increase in blood pressure. 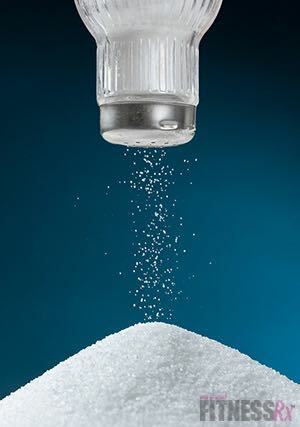 Long-term effects of too much sodium can result in heart disease, kidney disease or stroke. Simply cutting back on sodium will help to reduce fluid retention and decrease pressure on arteries. This is why hypertensive individuals must eliminate sodium from their diets. 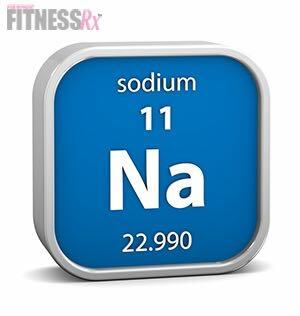 Do You Need More Sodium If You Exercise? When you exercise, the body uses sodium to fuel muscle contraction. It is also lost through sweat. Without proper replenishment, muscle cramping and fatigue will result. The American College of Sports Medicine recommends that people who are active for more than one hour should consume 500-700 mg of sodium for every 950 mL of water. Experimental data have shown that the loss of sodium in sweat ranges from 460 – 1840 mg per 950 mL of sweat. Although most people will get enough sodium as part of their diet, if you are a runner, take part in sports, or perform a lot of intense cardio, you may want to consider using an electrolyte sports beverage to help you stay hydrated during and after exercise. Many foods contain sodium including vegetables, but others contain more such as dairy protein and meat. For example, 1 serving of Greek Yogurt provides 36 mg of sodium, while 4 oz of steak provides 71 mg. Canned fish, pickles, soups and nuts can have significant amounts of sodium, if you don’t choose the low sodium version. But by far the foods that contain the most sodium are the processed and packaged foods, or food you would get at a sit-down restaurant or fast-food place. The Center for Science in the Public Interest found that 85 out of 102 meals at popular restaurant chains contained more than a full day’s worth of sodium! All that said, if you need to add a little salt to your diet, sea salt is a great option. How To Decrease Sodium in Your Diet? First things first, if you exercise intensely and follow a clean diet made up of mostly whole foods, you probably don’t need to cut salt out. You may need to add a little in. However, if you need to cut back on sodium due to a health issue, etc., begin by eating a whole food diet, free from processed foods. Opt for low-sodium condiment options or reducing the amount of sodium-laden condiments whenever possible such as soy sauce, hot sauce or even mustard at 57 mg per teaspoon. Instead, opt for dried herbs, spices or zest from citrus fruits to add flavor without the added salt. Is There Sodium Hidden in Your Food? If you are following a clean diet, you are probably not getting in as much sodium as the average person. However if you do eat some foods that are packaged or processed, there will be sodium. For example, if you buy frozen boxed meat be aware that sometimes meat can be injected with sodium as a preservative. Rice cakes also have sodium, if you are not choosing the regular, plain ones. You might also find sodium in your supplements or protein bars. Before making any purchases, read the nutrition label thoroughly, it will list the amount of sodium-containing compounds such as monosodium glutamate, sodium bicarbonate, disodium phosphate, sodium alginate, sodium citrate. Institute of Medicine. (2005) Dietary reference intakes for water, potassium, sodium chloride, and sulfate. 1st ed. Washington, DC: The National Academies Press. Institute of Medicine. (2010) Strategies to Reduce Sodium Intake in the United States. Washington, DC: The National Academies Press. U.S. Department of Health and Human Services, U.S. Department of Agriculture. Dietary guidelines for Americans 2010. Washington, DC: Government Publishing Office, 2010.